Volunteer for a good cause! For more than a century, Big Brothers Big Sisters of America has helped children reach their potential through professionally supported relationships with proven results. Lucky for the Whidbey Island community, Big Brothers Big Sisters of Island County has been proudly forming positive relationships since 1999. Mission Big Brothers Big Sisters of Island County matches children in one-to-one relationships based on friendship. Matched with caring volunteers, children gain new experiences while having fun. This not for profit organization is always seeking volunteers who possess high standards, are stable, honest and live with integrity in their lives. We assist children of every ethnic, racial, national, cultural and religious group in Island County who may need additional positive role models to further enrich their lives. Goal As a preventive program, the goal of Big Brothers Big Sisters is to reinforce positive attributes in children helping them to become confident, caring and competent adults within their communities. A strengthened sense of self worth at home, in school and in the community are often results. Children who have an older special friend tend to be less likely to be swayed by peer pressure, perform better academically and have a more even-tempered attitude. It is through this special friendship that our kids stay great! Guiding Principles and Values Children ages 6-14 who are willing and anxious to build a positive caring friendship may enroll as “Littles.” Volunteers age 19 or older - individuals who are willing and able to be a child’s friend - can become “Bigs” in community matches. High school volunteers can become “Bigs” for younger students in the school-based program. Today, Big Brothers Big Sisters remains true to the vision of bringing caring mentors into the lives of children. Big Brothers Big Sisters currently operates in all 50 states and in 35 countries around the world. In Island County alone, 250 matches will be made this year. 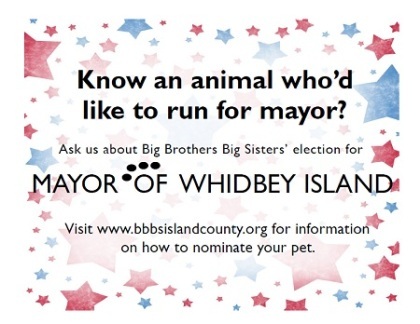 For more information on becoming a Big or Little, or to learn more about opportunities to give, visit www.bbbsislandcounty.org or contact the Big Brothers Big Sisters office at (360) 279-0644 or bbbs@whidbey.net.